When you Google "best tool for..." you'll quickly become overwhelmed by the results. Many of your results will be from ads and several others surface to the top based on their strong content marketing. Not to say you won't find a helpful tool, but wouldn't you rather just ask people you can trust? That's why when Mark from Thinkific reached out to me with a post reviewing top tools to cover business and marketing needs, I was excited to dive in. 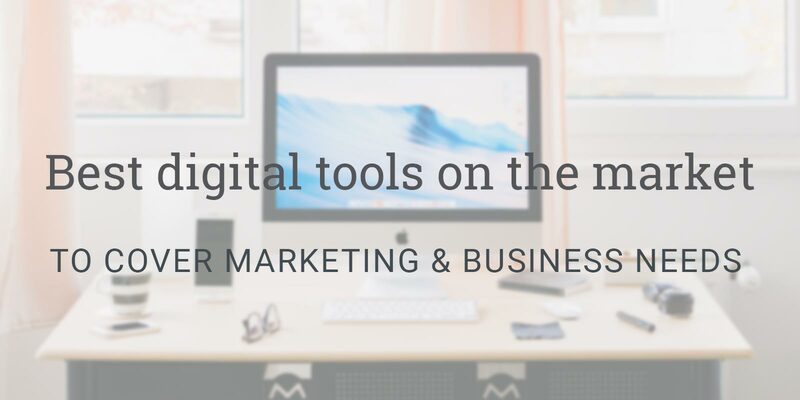 One post that covers tools in everything from social media, design and email marketing to technology, outsourcing work and finance. Best of all, it's curated by real people – their "community of entrepreneurs and online course creators." If you want to review several options in each area, take in the full post here. Otherwise, I've pulled out the tools we've used at ArcStone and some additional resources for each below. I'm excited to get us all in gear for the new year and beyond. ArcStone made the big switch over to Slack over two years ago and it has changed our office communications for the better. For the full story, read our review and why we, as a tech company, chose it over all the others. In short, Slack is a cloud-based communications tool that operates around both team channels and direct messaging. We have channels for various needs: client projects, marketing teams, dev teams and general office announcements. The tool stores files, integrates with other tools like Google Drive and Trello. We even use it as a way to boost team morale with a channel we call #kudos. Be careful though, we've also noticed one negative trend regarding Slack. Since it's so easy to use and fun, we have a tendency to participate in what we call "dislacktion." Basecamp has been a integral part of our project management workflow for several years now. Despite other software companies reaching out and promising better options, Basecamp stands strong. The tool allows all your client messages, files, notes and calendars to be in one central hub. Instead of relying on email strands and cc'ing team members to keep them in the loop, Basecamp sets up messages under each client. You can change up permissions and send private messages to keep things secure and/or confidential. It has come in handy when we need to keep track of the work of employees that have moved from the company, instead of accessing their old files/emails. Bottom line: it's essential to have one place to send each client when you onboard them. Many tools are out there, but Basecamp is our go-to. Here's another tool we just can't get enough of. We first implemented Trello as a helpful tool in managing some of our content marketing, as we were ramping up our efforts. We thought it would be a nice temporary solution given that it's free and easy to use. Instead, we've been using it for about three years, and continue recommending it to all of our clients. It's so intuitive and it's visual element keeps things feeling manageable. We've used it alongside Hubspot for blog management and many of us use it to manage our personal to-do's. In fact, we quadrupled our blog traffic with Trello's help – view the case study. We also used it to launch and manage clients blogs, such as five blog sites of HealthPartners. Tools for managing social media are constantly popping up on the market. For our internal marketing purposes, we've been using Hubspot, however for clients who can't afford this or whose CRM doesn't have this component, we recommend Buffer or Hootsuite. Besides the features of Buffer listed above, Hootsuite also allows you to manage conversations happening on social media so you can more easily monitor your comments/messages without necessarily logging into that social account. We have a lot of clients who worry about unattended social interactions (as they should!) and this is the tool we often have them check out. Though they aren't listed in the top 40+ post, we also recommend MyEmma and Constant Contact, depending on client needs. Take a look at our comparison infographic. Whenever a client is stumped on how to grow their email marketing list, we recommend one of Sumo's tools called list builder. Sumo (even the free version) allows you to install a pop up on your site, personalized to your aesthetic and messaging and then export that list of contacts. Besides this key tool, they have a Welcome Mat for greeting new visitors to your site, social sharing icons and Smart Bar for a more subtle newsletter subscription option. Learn more of their tools and click on each to walk through demos on how they work. The truth is, when it comes to marketing research and finding inspiration for your content, there's no singular place that will offer you all the answers, not even Google. The best approach is to have a big toolkit. Here's our go-to list of content marketing research sites that have helped us write for clients from health care to nonprofits to SaaS providers to lawyers. You'll have all the insight you need. Below are two recommended by the Thinkific post that we use daily. This tool is your insight into what others are searching and writing. It helps you see these trends over the course of time, how they are increasing or decreasing in popularity. If you're trying to keep up with the Joneses, here's a solid place to start. Target your market, with a post that walks through how to use Google Trends. If you're looking for trends beyond what people search, and instead want to know what people are sharing and spreading across social media, come to Buzzsumo. You can also sort through trends based on what influencers are sharing, which is key to keeping up these days given the power of influencers. Read about how to increase your brand awareness by capitalizing on brand ambassadors. Canva is a tool our marketing team has used daily when quickly whipping up a social media or blog image. It allows designers and nondesigners alike to take a basic image and add text or other visual icons, without relying on complicated tools like the Adobe Creative Suite. They also have options for more extensive graphics like infographics, ebooks and brochures. One caveat: be careful when using this – if you don't have any design training, you may want to stick to their exact templates so you don't appear unprofessional with clashing colors or wonky layouts. We love this tool so much, we reviewed how to best use it in this post, "Freshen up your blog images, for free" and included some nice supplementary tools. Now, for the full scoop and more insight on areas we missed (financing, outsourcing, webinars), check out the original blog post. If you're still feeling overwhelmed, shoot us a message or give us a call. We often provide advice to people like you, whether or not they become clients, and find that there are some simle solutions to their day-to-day work problems found in these tools.